“Cenacle” is a word for the upper room where Jesus’ apostles gathered together in prayer with his Mother Mary, and the Holy Spirit powerfully descended upon them. It was during this original Pentecost that the Catholic Church was born. Two thousand years later, Our Lady renews the call to gather together with her in cenacle of prayer in anticipation of the Holy Spirit. Prayers for our Holy Father, the Pope. Reading and meditation on one of more of the messages given in the book, ” To the Priests, Our Lady’s Beloved Sons. The Act of Consecration to the Immaculate Heart of Mary. As a time for invoking the Holy Spirit through Mary, the cenacle ought to begin with either a hymn to the Holy Spirit such as, “Come Holy Ghost,” or with the short invocation given by Our Lady herself in her messages of June 7, 1981 and June 3, 1990. Since the cenacle is where we gather to pray with Mary, the recitation of the rosary, Mary’s prayer par excellence, is characteristic to all cenacles. 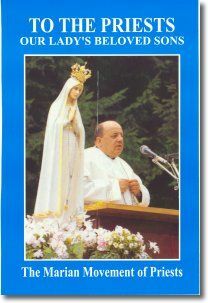 “When you recite the rosary you invite me to pray with you and, each time, I truly join in your prayer.” (148p, Feb. 11, 1978) – * The recitation of the rosary must always be accompanied with meditation on the mysteries. Unity with the Pope and the Church united to him remains an indispensable characteristic of the cenacles of the Marian Movement of Priests. *With the recitation of the rosary, it is customary to pray one Our Father, one Hail Mary and one Glory Be for the Pope’s intentions. These fully satisfy the conditions for obtaining the indulgence attached to the rosary. Within the cenacle, there is always a reading of a message from the book, “To the Priests, Our Lady’s Beloved Sons.” Meditation on Our Lady’s messages is necessary for they trace out a simple and luminous way which we are to travel in order to grow in her love and in life with her through the consecration to her Immaculate Heart. Although some prefer to maintain an atmosphere of silence during the cenacle, it is acceptable to allot a brief time specifically for fraternal sharing so that, as Our Lady says, we can know each other, help each other, and love one another as brothers brought together by her. (message #34) Our shared presence with Mary in an atmosphere of prayer, enables us to strengthen and encourage one another precisely so that we may go forward in our consecration. NOTE: This time must never digress into a discussion of other topics, apparitions, messages or devotions which could impede Our Lady’s work in the souls of those joining you. It is the request of our Blessed Mother that the cenacles remain pure in spirit, therefore we must respect the structure which has been laid for the cenacle. Consecration to the Immaculate Heart of Mary is the first commitment for belonging to Our Lady’s Movement. By this Act of Consecration we put our life into her hands, completely and without reserve, so that she may transform us into the image and likeness of her Son, Jesus. HOW TO BEGIN . . . The cenacles can be a combination of one or more of the following: Priests, Religious, Laity, Young People, Children. They may be held nationally, regionally, by diocese, in communities at large, in parishes, in religious houses or in one or more families.